2013 is off to an amazing start! 2013 is off to an amazing start! It kicked off with Sarah Powers here in Melbourne for the first time at the lovely Grass Roots yoga in St Kilda. Not only did we get to host Sarah for a 2-night yin workshop but I also had the privilege of getting to know Sarah and her husband Ty Powers as I helped Grass Roots owner Shannon Barry show them around Melbourne. Shannon was so inspired by Sarah’s teachings that he’s off to study with her in France in May! And I’m seriously considering her training in Thailand in November (unless we can get her back to Melbourne instead – stay tuned!) 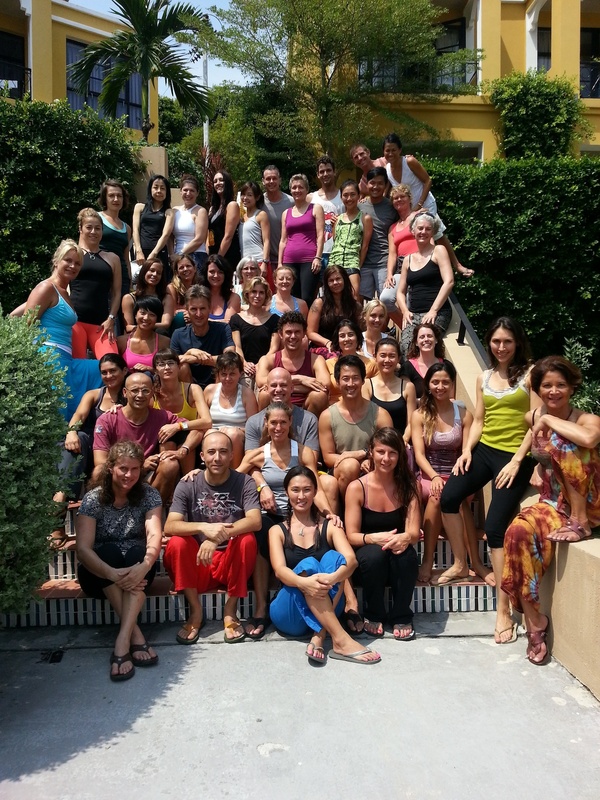 Two weeks after Sarah’s visit, I left for Absolute Sanctuary in Koh Samui, Thailand for the Level 2 Yin Yoga Training with my long-time teachers Paul and Suzee Grilley. In 2009, I attended the Yin Yoga Level 1 immersion with Paul and Suzee at the Land of Medicine Buddha in California. The Level 1 training focuses on anatomy and understanding how to differentiate between muscular tension and skeletal compression in yoga postures. With this understanding, you learn how to adjust yourself and your students in yin yoga postures in order to work around skeletal compression to safely and moderately stress the connective tissues of the body. The focus is on the physical experience – where and how do I feel the stretch or stress? How can I change the position of a hand or foot or shift my weight to change, increase, or decrease the sensation? How do I sequence yin postures to have the maximum impact on the target area of the body? How does my body feel during and after the pose? The approach is hands on and experimental – you test the theories of yin yoga in your own body and observe and discuss how different postures and sequences affect others. When I finished the training, I realised that much of what I had been taught about yoga was much more aesthetic than functional and it certainly didn’t allow for different experiences in different bodies. It forever changed the way I think about yoga postures and practice and it changed my approach to teaching. A year after the Level 1 training, my husband and I moved from Washington DC to Melbourne Australia and I decide to become a full-time yoga teacher. It took about 2 years to grow a yin community here in Melbourne but thanks to the support of several studios and dedicated students, yin has really found a home here! And with Melbourne yogis eager to expand their yin practice, I felt like it was time to head back to Paul and Suzee for Level 2 training. This immersion focuses on a more in-depth understanding of how yoga postures and meditation techniques can enhance the flow of chi through energetic channels called meridians and direct chi to energetic power sites in the body called chakras. The training combines the same hands-on, experimental approach as Level 1. Your own body becomes a laboratory and you are the diligent scientist, testing various mediation techniques and the sequencing of yin postures to stimulate (and possibly direct) the flow of chi. Modern Meridian Theory suggests that meridians are water-rich channels deep in the fascia and that the chi or energy that flows through these channels is a “coordinating intelligence” that plays a central role in the growth and development of our cells. So we took the same set of yin postures but approached them less as stretches for the muscles or ways to lubricate the joints and more as pathways to feeling the more subtle energetic pathways. We experimented with various mediation techniques – from more physical bhanda practices to more subtle visualisation techniques. Although the mediations were introspective in nature, the process of learning and refining mediation techniques was collaborative. And when you meditate in a room with 40 people every day, you are definitely giving and receiving energy! I kept a meditation journal during the training so, if you’re curious about meditation, stay tuned for some excerpts. In the meantime, my yin class schedule continues to grow. Most recently, I’ve added a Monday 9:30am Yin at Power Living Union Street, a Tuesday 9:30am Yin/Yang at Grass Roots, and a Thursday 8pm Yin at Power Living Fitzroy. I hope to see you on the mat soon!